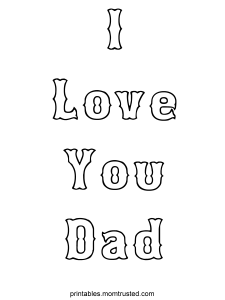 Color our I love you dad coloring page and give it to your wonderful dad! Idea: get creative and use paper, noodles, paint, glue, feathers to truly make this a work of art! Make sure you send us pictures or scans of your colored page or even better of you and your dad with your coloring page!! Do you or your kids ever draw their own coloring pages? If so, send them to us and we’ll post them for other kids to use! Submit your coloring page here!